There’s always more to it than we know about. It’s a line from Hemingway’s short story “The Three Day Blow,” and it’s not one of Papa’s most famous quotes. “The Three Day Blow”– one of the Nick Adams stories–is about two teenage boys, Nick and his friend Bill, who hang out at Bill’s cottage one stormy weekend and get drunk, talking about life, writers, and girls. Of course, I wrote the teacher’s remarks down in a spiral notebook and made sure to regurgitate them in my final paper. But the line stuck in my head too, and the older I get, the more often I find myself reciting it, either to myself or to my kids. Oddly enough, it helps me through a lot of complex and/or potentially infuriating situations. When a car cuts me off in traffic; when I get the sense that someone’s lying; when someone close to me gets confused or upset over social politics, “There’s always more to it than we know about,” tends to find its way out of my mouth. And usually, I feel a little better afterwards. This entry was posted in writing and tagged hemingway, hemingway hero, quote. Bookmark the permalink. The three day blow is one of Hemingway’s best works of fiction. 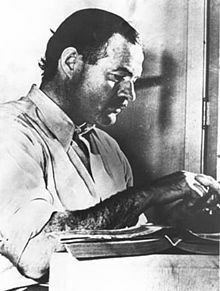 I have a literary blog myself, and it is so wonderful to meet another writer who loves Hemingway’s work as much as I do. You’re description and analysis of the quote is more beautiful than I can say. Thank you, Courtney! It’s great to meet you as well, and your blog is wonderful. I just started following it and look forward to reading more.